Football academies are the biggest new trend in Ghanaian football. In every corner of the country's major cities there are people running football schools and promising youngsters they can help them achieve their dream of becoming professional footballers. Some have had remarkable success, others have struggled and worse still the system has sometimes been infiltrated by tricksters who have taken advantage of boys and left them stranded in Europe. Those are the mistakes that the West African Football Academy in Ghana wants to avoid. Previously the Feyernood Academy in Gomoa Fetteh, it relocated to Sogakope, just outside Acra, and took over facilities at the former Red Bull Academy. And those facilities will shame even the biggest clubs in Ghana. There are five artificial pitches including one with a complete stand, 36 air conditioned dormitories that houses 80 students, a gym and library. The set-up is focused on developing football talent but not exclusively obsessed with creating the next big superstar. "The only thing I can hope is that we continue to produce good players on every level. If we have a star - fine - but the most important is that all the boys who pass through us get a place somewhere, that they don't fail and they can make something of their life," Karrel Brokken, the Belgian director of the academy told BBC Sport. Brokken has been involved with talent development in Ghana for 15 years and oversees a network of scouts who visit various parts of Ghana and West Africa to identify the best young talents and put them up in the academy. A lot of those boys arrive with big dreams, such as 12-year old Ransford Darko, who says he wants to play for Manchester United. Technical director of the academy, Sam Arday, a former Ghana coach who won the U-17 Word Cup with Ghana in 1995 and masterminded Africa's first Olympic football medal; a bronze with Ghana in 1992 believes Darko will become one the biggest football stars in Ghana. "I want to be famous", said Darko. "I want to be one of the biggest stars in the world. I want to prove that there can be a defender who can win a Ballon d'Or." His ambition is matched by Joseph Amoah, the captain of the academy's senior team who will play in the top flight of Ghana football next season, who has his heart set on paying for Real Madrid and adores Sergio Ramos. But the journey to making those dreams reality can be tough and complicated. The players spend practically the whole time training, schooling and travelling around Africa and Europe to play in tournaments. Arday revealed that out of 10 players, about three will go on to have big professional careers in Europe. The success of their alumni suggest the academy is doing something right. 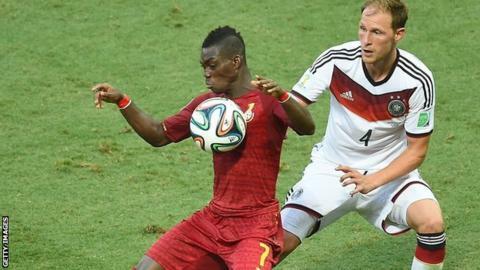 They include Everton midfielder Christian Atsu and Harrison Afful, a right-back at Esperance. Both players were part of Ghana's squad at the 2014 World Cup in Brazil. "We have players everywhere in the world. We have players in the Ghana national team, we have players in Portugal, England, Belgium, we have players with Esperance, Mazembe and over the whole continent. It is quite successful," Brokken said. The mandate of Arday and Dutch coach John Killa is to ensure that the production line continues to churn out the best possible talent not just for the European leagues but for domestic football, too. Killa is convinced the conditions in Ghana are perfect for that process. "The technique and the speed which is very important in football now is an advantage", the Dutchman said. "The players in my country don't have the speed and the technique. We have to learn them but here it is natural. So they come here and you try to develop them to become professional players." "Compared to Europe, if you look around, it's the same and sometimes better because you can train here every day. Sometimes in Europe you have to go indoors because the snow or rain is coming. I think this whole project is going fast. Talent is growing quicker than in Europe." The youngsters who arrive from across Ghana and West Africa admit they are lucky to be honing their skills at the modern facilities while aspiring to become the next Didier Drogba, Samuel Eto'o or Michael Essien. "They have helped us improve a lot, think faster and improve our abilities", said 15-year-old Kevin Boakye Yiadom. "Things are moving on very well." There will be many in Ghanaian football willing on the youngsters there and in other academies to achieve their dreams.